This is the 6th Anniversary of my first post on International Liberty. In honor of this moment (or at least to recognize a modest amount of endurance), let’s review some data on readership. According to WordPress, there have been more than 8.7 million page views in that six-year period. I don’t know if that’s good or bad, so let’s look at some data that’s more interesting. There’s a site called Flag Counter that monitors the location of readers. I didn’t add it until the end of 2010, and it counts daily viewers rather than total page views, but that’s still plenty of data to see the degree to which people in various states and nations are interested (or disinterested) in my writings. 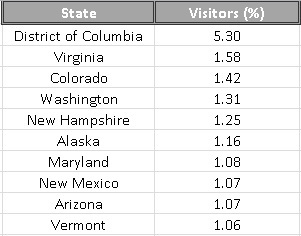 Far and away, the highest share of readers, relative to the population, can be found in Washington, DC. I guess that’s no surprise with all the Capitol Hill staff, journalists, and policy wonks in town. And I bet, based on where many DC people live, that partially explains why Virginia is in 2nd place and Maryland in 7th place. So maybe the most appropriate conclusion is that libertarians and small-government conservatives are most likely to be found in Colorado, Washington, New Hampshire, and Alaska, with honorable mention for New Mexico, Arizona, and Vermont (though the good people in the Green Mountain State are heavily out-numbered by moochers). Now let’s look at states where I’m relatively unpopular. Southern states don’t seem to like me, though I wonder if that’s because of lower-than-average levels of Internet access (that being said, Georgia is in 15th place, perhaps out of Bulldawg loyalty). Shifting to other parts of the nation, Hawaiians don’t seem to be big fans. Neither are people from the Dakotas, or folks in Rhode Island and Delaware. What about if we look at viewership by nations? You might think that I’m most widely read in the United States because that’s where I live and work, and the majority of my columns focus on American public policy. But it turns out that people in the Cayman Islands and Anguilla are actually the most likely to read International Liberty. I imagine that’s because folks in those places have a keen interest in some of the tax competition issues that I write about. And that also explains why Bermuda, Monaco, BVI, Jersey, and many other so-called tax havens rank so highly for readership. 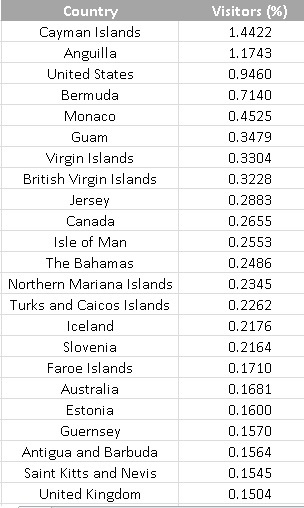 I’m not quite sure why the U.S. Virgin Islands rank near the top, and I’m similarly perplexed that there are high levels of readership in Guam and the Northern Marianas Islands. Maybe readers from the military? The high rankings for Canada and the United Kingdom are understandable, if for no other reason than common language. If I had to pick nations with relatively high proportions of libertarian-leaning readers, then it’s worth noting that Iceland, Slovenia, the Faroe Islands, and Estonia are in the top 20 even though English is a second language. Of course, just as there are nations that are likely to read International Liberty, there are also places where people don’t seem overly anxious to read my analysis. By the way, I’ve been told that the Chinese government blocks my blog, perhaps because of this post. Though China still ranks higher than North Korea. 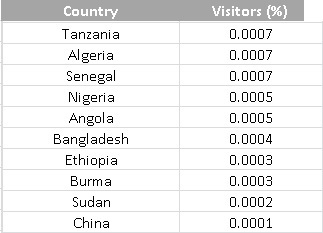 I’ve never had a single visitor from that horribly oppressed nation, or from 13 other jurisdictions. I know this is a late post, but Dan, I read your stuff all the time. Sometimes I even forward it to my friends. I live in PA. Proud to have kept Massachusetts out of the bottom 5. However, the stats don’t mean much about where the “true belivers” are since the numbers are not akjusted for location size. 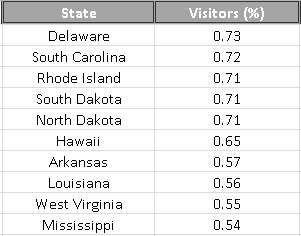 For esample, I’ll bet that Utah and South Dakota have a much higher % of their populations that are in sync with your posts than DC, Virginia, etc. I guess, not too many readers in Idaho? I read from this blog almost every day. The Hawaii statistics are probably mostly me. It’s lonely out here in lefty land! Dan, please rerank it based on population – I am itching to know how NY, NJ and CA rank under those conditions (hailing from Orange County, one of your [few?] dedicated readers from the Golden State). You need to re-sort your readership by adjusting for population statistics. For instance, you may find that on a per-capita basis, North and South Dakota read you more than you think- it is a sparsely-populated region. You should weight this by population. Several recent op ed pieces available upon request . This is one of your faithful readers in Mexico. If you check the least we are the country with most readers even more than liberal nations like Chile and Peru. We would appreciate to know your point of view about the reforms hel by the presidente Peña Nieto. I don’t read. I just write. Reblogged this on Brian By Experience. 5 tmes a week from Canada! Been checking in occasionally for some time now from my home and office in Seoul, only 25 miles away from the North Korean kingdom ruled by the Kim dynasty. Fortunately, however, there are a few thousand miles between here and Emperor Obama’s lands in this brief, supportive interlude to the Bush-Clinton succession process. Dan, any views you get from China or N. Korea would be the privileged censorship bureaucrats who are just checking to confirm that your blog is still off limits to the masses. Somebody has to manage the censorship software settings at their internet hub locations.